Somehow this feels like the right season to have some steaming tasty Japanese hot pot, and I found my way to Danro under the Ministry of Food (MOF) hybrid at NEX. Not a big fan of buffet though, since I am a small eater (*cough cough*) and you don’t usually get much quality food at all-you-can-eat places. My table of four was first very surprised at the pricing – $16.90++ for weekday lunch, $22.90++ for weekday dinner, and $24.90++ for weekend dinner. Danro also offer very special rates for senior citizens and children. (I wonder how they earn!) Well, having hot pot is a great way to bond together with family and friends yah? The food here may not come in large massive quantities, but had quality ingredients such as salmon, prawns, shabu shabu beef and pork. 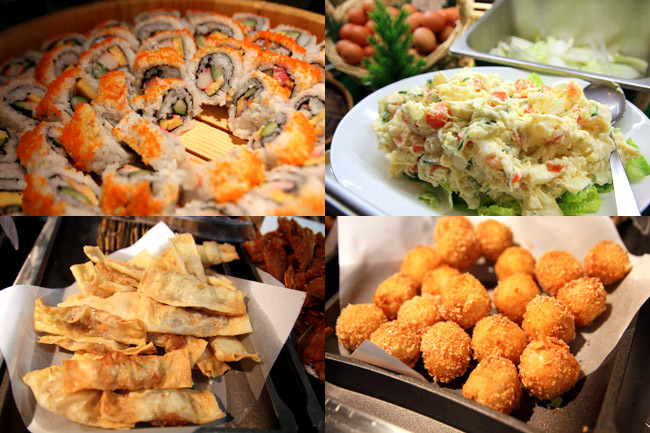 Sushi, deep fried items, fresh fruits, soft serve ice cream, assorted daily desserts and drinks are ALL-IN. Though I can probably skip all the seafood, and just spend my time shabu-ing away and dipping the thinly-sliced meats into home-made ponzu sauce and sambal chilli. Oishii! 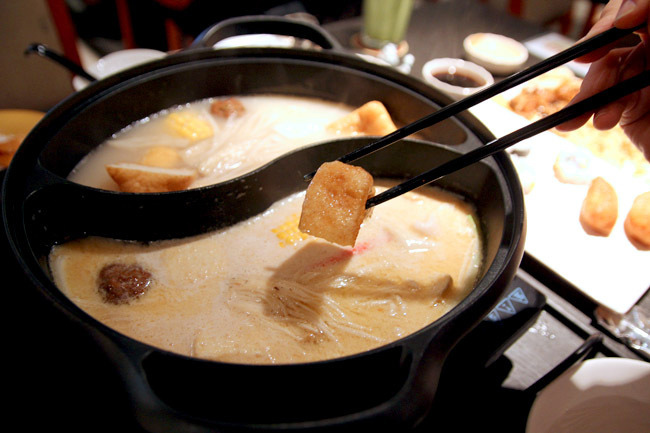 Danro is the 1st hot pot restaurant in Singapore serving specialty hot pots from different regions in Japan – nine in total. 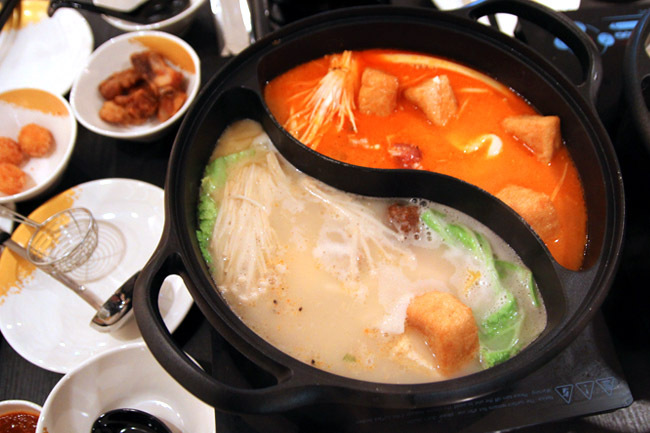 Each pot is a half-half ‘yuan-yang’ with two choices of soup. That also meant we managed to try four soup bases. Great since Singaporeans love variety. Our favourite was the Chicken and Milk Broth from the Nara region, a light and popular tasting soup with balanced savour of chicken, tofu and mushrooms. While I hear that many locals do not fancy the lighter Wafu soup from Akita, this was my next favourite as it brings out the flavours of the dory fish slices and beef. [Giveaway Ended] Danro Japanese Hot Pot Vouchers Giveaway! Danro Japanese Hot Pot Vouchers at NEX will be giving 10 sets of $20 vouchers to 10 blessed Daniel’s Food Diary readers to enjoy the delicious buffet! *The above entry brought to you by Ministry of Food (MOF). Din get to eat this in Japan becos weather was not cold enough to give the restaurants a reason to serve this… so now die die must try. Milk Broth! the milky taste goes well with the fatty pieces of meat! I have not tried DANRO but I love milky and rich soups so I would go for the Chicken and Milk Broth! I'm sure it will satisfy my taste buds! I have not tried DANRO but I love milky and rich soups so I would go for the Chicken and Milk Broth! I’m sure it will satisfy my taste buds! Can't say which I would like yet as have yet to try this place – but I am a sucker for anything with Miso… so I think I will like that! I love the name Tonkotsu soup because it sounds tasty! I am a big fan of ramen and I LOVE SOUPS! Hi Daniel! This place looks really yummy! Liked and Shared. Thank you. Thanks Daniel for introducing something so special & near me! My favorite is Tonkotsu Miso because it is s the Holly Grail of noodle soup broths. It’s thick, creamy and nearly white in color. Every mouthful I can simply taste the natural shimmering concentrated flavour of the ingredients. For a person like me who do not eat spicy food, this is definitely my best choice. Would like to try this soon! I love to try this jap hotpot. I want to try the tonkotsu soup base. The soup broth is thick and I’m a ramen fans. Can’t wait to try !! Would like to be “imported” back to Japan with these sumptous delicacies right in Singapore! Love to try the Chicken Spicy Broth , love spicy food and soup ! yum yum, I've not tried the broth yet but I think I will like the chicken and milk broth because I like creamy broth and it looks so yummy. Chicken and Milk Broth for healthy tasting meal ! Wow! I love the sound of the chicken and milk broth! My favourite Danro broth is chicken and milk broth because it looks light and yummy from your recommendation. Definitely Wafu soup from Akita for me. It brings out the authenticity and flavour of each food item so you get to satisfy everybody's taste buds. The best part is you save the best for last, soup climax! Soup sooo rich in everything (after all the food you have put in. Now that's what I call a grand finale. Definitely Wafu soup from Akita for me. It brings out the authenticity and flavour of each food item so you get to satisfy everybody’s taste buds. The best part is you save the best for last, soup climax! Soup sooo rich in everything (after all the food you have put in. Now that’s what I call a grand finale. my favourite dano broth is chicken & milk broth because i like milky broth and from your blogitlooks delicious. Tonkotsu Miso! I love the rich soup filled with the goodness of pork bones! looks special and yummy from yr blog. Favourite soup base? Tonkotsu Miso, definitely! it's the most standard flavour, and yet, the hardest to perfect! Tonkotsu Miso Broth! Lovely Taste! my favourite danro broth chicken and milk broth as i like creamy and light tasting soup. My favourite danro broth chicken milk broth as i love chicken soup and i am curious about chicken milk broth. Not tried it before but I guess I would like the Chicken and Milk Broth since its light and bring out the flavour of the ingredients. would love to try out the different soup bases, (drools). Feeling so much to try on this steamboat.. thank Daniel for alway introduce the best to us. My favourite is definitely the Tonkotsu Miso, because I love ramen too! Tonkotsu Miso would be my choice , flavourful with every mouthful.. I'll love to try the chicken spicy broth because a good combination of spiciness and chicken is hard to find in Singapore. What's more, being a big fan of Japanese food, the Japanese hot pot from Danro is something that I would not want to miss out on. The wide variety of food choices and the soup base is definitely enticing and making it drool. Japanese style broth! Is light and refreshing! So yummy live Japanese food! Thank you for the great food! My favourite DANRO broth will be their Wafu Miso broth which brings to mind the rich flavours of Hokkaido. I'd love to dip my Kiritanpo into the broth! just the best combination ever. Wow wafu should be light and nice! excited to go try! I guess this is a new eatery at NEX! 2stops away from my house thanks daniel for the post! shall go try out the japanese style broths as I find usually such broths would be salty.. hope it does change my impression! GAMBATTE! Hope to try this out!!! the pictures looks so yummy and tempting! Wafu soup from Akita. Good to start from a light soup base and let the food sweeten the soup and thicken it. I like the traditional Tonkotsu cos it’s just so comforting after a long and hard day at work. It would be the chicken and milk broth. Using milk to thicken the chicken broth reduces the amount of fat and calories, and it will definitely taste great but less sinful. I like the Chicken Broth. liked and shared with my group of friends. Omg! I am soo interested and keen to try the Chicken and Milk broth! I think it is definitely a great combi for hotpot! 😀 Smooth smooth food with milk, hehehe! Love the Chicken and Milk Broth! both my favourite items in one! cant wait to try them! My favourite will be the Chicken and milk broth as it sounds delicious from the description & something that i have not try before. Chicken and milk broth! CAUSE I LOVE MILK! 😀 😀 😀 and milk enhances the taste of the chicken making the broth thick, rich and flavourful. Would love to try the Spicy chicken broth! And with a Yuan-Yang pot, i will be able to have best of both worlds! 1 spicy 1 milk broth! Dipping the thin pork slices= yummmmmy! My fav is the Chicken Paitan!! I think i would love the Tonkotsu Miso as i love ramen and the strong flavor of broth and the milky broth as is creamy and good as a base for pork slice! My favourite would be Chicken and Milk Broth…because I've never try that! My favourite would be Chicken and Milk Broth…because I’ve never try that! My favourite DANRO broth is the Tonkotsu Miso as I love the taste of the soup of pork bones mix with my favourite miso. Liked and shared! Would love to try it!! Japanese style broths is my favourite! Chicken and Milk Broth is my top choice. The special combi of chicken mix with milk produce the tasty aroma in the broth that will only leave me craving for more. Yummy ! The Japanese Style Broth is a good Danro Broth and because its refreshing and original. I prefer the chicken and milk broth. it should bring out the essence of chicken taste and the milk will provide the soothing and smooth experience from the hotness. it would be like having kopi/tea with milk, only that this is now substituted with chicken broth and milk. a 'milky chicken' experience I might say…………..
Chicken and Milk Broth. Sounds too delicious!! Liked and shared! Would love to try it!! My favorite is the chicken and milk broth because I’ve tried something similar in Japan and it was fantabulous. Now the photos you took leaves me craving for it again! The Chicken and Milk Broth, because it looks delicious and I like chicken & mushrooms! My favourite is the Tonkotsu Miso! I don't take spicy , so usually I'll just have the traditional chicken herbal or seafood base in the past. Now with Tonkotsu Miso, I can try out something different! My favorite is Tonkotsu Miso because it is thick, creamy and white in color. In past, The traditional chicken herbal was recall the best dish for me. chicken and milk broth. just pure chicken broth for it's goodness and that milky addition to make it even more creamy and yummy! My favorite would be Chicken Spicy Broth. I like my broth with the sweet taste of chicken plus spiciness! All the food cooked in this broth would taste especially fresh, sweet and delicious! My favorite is the Chicken and Milk Broth simply because it is tasty and milk is good for the body. I have not try danro before. Fukuoka Broth!! They are hearty and filling and makes for a wonderfully social meal! My favourite DANRO broth is Chicken & Milk Broth because it is lovingly prepared from yummy ingredients that I love: chicken, mushrooms, shrimp, tofu and vegetables. Chicken & Milk Broth is my favourite DANRO broth as I like chicken soup. miky broth as it's got a lovely milky texture and richness of natural stocks. Chicken and Milk Broth because I love milky & rich broth <3. Gambatte! Milk Broth! the taste goes well with the fatty pieces of meat and i like it very much! Tonkotsu Miso is my choice! Nothing better than the happy marriage of pork broth and miso! Can't wait to try it! Chicken and milk broth! Goodness in every mouthful. My fabourite broth is chicken and milk, cos it’s very tasty and I spent most of the time drinking the soup than eating anything else! It also does not make me feel thirsty after the meal, which goes to show that their soups do not contain any MSG. My favourite is Chicken Spicy Broth as I like broth with some spiciness & it’s delicious! The Chicken and Milk Broth sounds tempting.. .a light and popular tasting soup with balanced savour of chicken, tofu and mushrooms. Oishii !!! I’m definitely a ramen soup lovers so my pick would be the Tonkotsu Miso! Tonkotsu Miso Broth! I love Miso and it's natural sweetness n goodness. My favourite is the Tonkotsu Miso broth because it's simply refreshing and delicious! Yap, I like Ramen Soup too ;-P.
I love the milk and chicken broth because there includes my favourite ingredients and i have nevery try milk broth soup base before too! I love the chicken and milk broth because it’s so yummy that makes my crave for more. Chicken spicy broth anytimes plsssssssss!!yums!! I love them all, especially the Tonkotsu Miso cos’ I prefer it natural without the spicy. Would very much love to try the Chicken and Milk Broth! Sounds delicous already! I love Chicken Spicy Broth because I think spicy broth can energise me after a day's work. I am a fan of steamboat !! Haven tried danro before!! Would like to try the chicken spicy broth !! Just in time for cny !!!! I love the sound of the chicken and milk broth because it sounds healthy and yummy. Chinese new year is around the corner too! Thanks for the giveaway and happy cny! 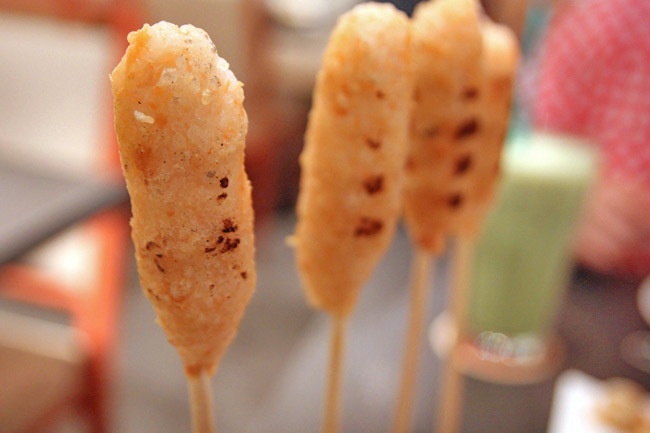 The rice on a stick looks real interesting. Sounds like an interesting place to try out. I love Japanese Hot Pot & Buffet. Just sitting around the table either with friends or family, taking our time to cook the food and chit chat. I love chicken and milk so the Chicken and Milk Broth is definitely the one for me … looks really delicious. I would wanna try the Tonkotsu Miso cos I love ramen!!! 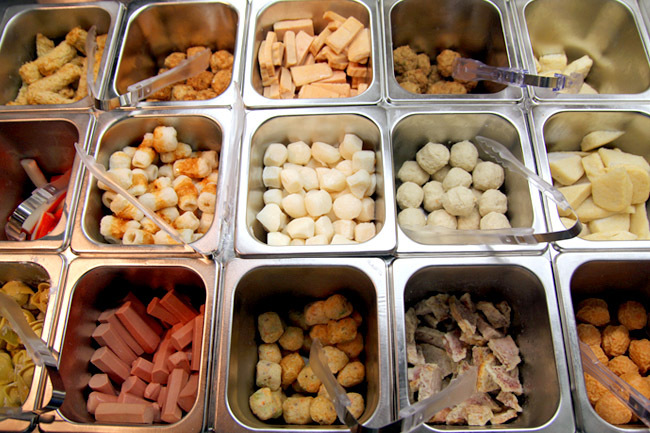 Yum Yum…..
would love to try the tonkotsu broth! wonder how it would taste with the food instead of ramen! Wow…delicious. I claim the prize! Awesome! it's ok if I do not get to win the voucher but its a good thing to share the GOOD food experience with other food lovers so we know where to get good food Cheers! Give Me A Chance To Try Out! Chicken and Milk broth cause the warm taste of chicken and the creamy-ness of the milk makes it feel like you are cooking shabu shabu in a pot of homemade campbell chicken soup! I would love to have chicken miso and wafu miso soup bases! Die hard fan of miso! Chicken and milk broth sounds good! hope to have the chance to go shabu-ing! Thanks for sharing, never expect the broth looks so good and tempting. I like soups to be rich and full of substance, would definitely go for chicken & milk broth.. sounds like they put in alot of sincerity.. cooking it over 10 hours. Much as the soup base is important, the quality of the meat has caught my attention too. Worth a visit! So many to try with delectable good tasting yummylicious broths but my favourite choice would have to be Tonkotsu Miso! The creamy thick soup brew more than 10 hours a day will certainly sip through perfectly and will never go wrong with the wide varieties of food choices that comes together, Danro, I'll certainly be heading for more to try out all the soup bases one by one! Looking at those pictures make me drools…. I really wish to have the chance to savour them real soon! Please grant my wish!! I will go for the chicken and milk broth! Its a perfect combination of my favourites! Chicken never go wrong and milk naturally beautify my skin from within! Seriously no one can resist the temptation of 10 hours hard work whipping up the fantastic soup! Let alone the varieties that are going along with it…. slurps***!! 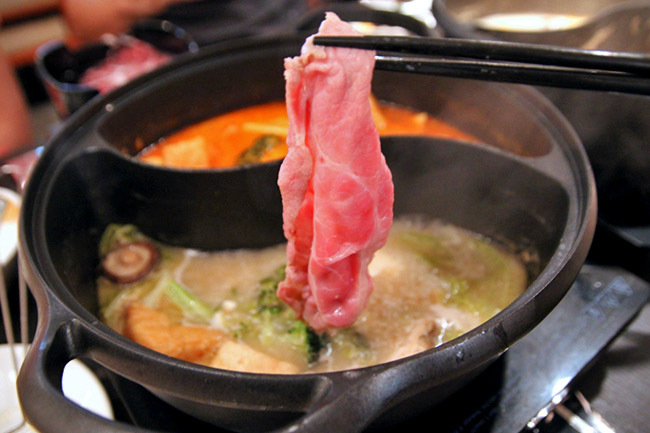 I can see myself shabu-ing real soon! definitely the Chicken and Milk Broth ; ). Congrats to Justin Chong, Ioyces, Feng Chen, Yvonne Quek, Siew Nah, Tan Yi Jing, Soh Ching, Sasha Ng, Eunice Kong, and Roger Cheng. 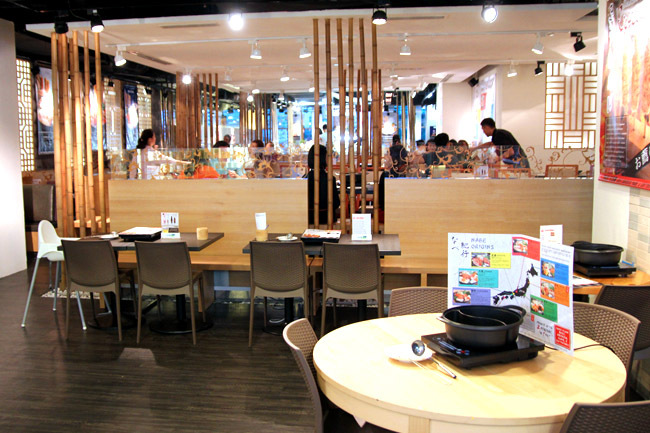 You have each won for yourself a $20 voucher from Danro Singapore to enjoy the delicious Japanese hotpot buffet. Please send an email to DanielFoodDiary@gmail.com with your contact details. Thank you everyone for taking part. There are so many of you, and we can only randomly pick 10. Hopefully you win in the next giveaway! I would love to try the Chicken and Milk Broth. It sounds special and really yummy looking from your post! Dont leave the shop even though you wrote down your name and number because they dont bother. Sit down and wait till its your turn.